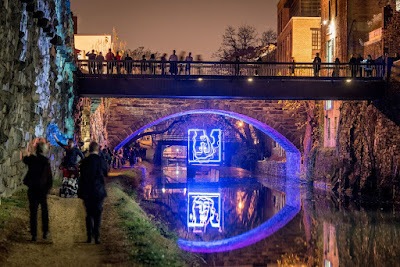 Georgetown GLOW—the popular holiday celebration featuring outdoor public light-art installations that invite visitors to “re-imagine the season of light,”—comes to a close on Sunday evening. 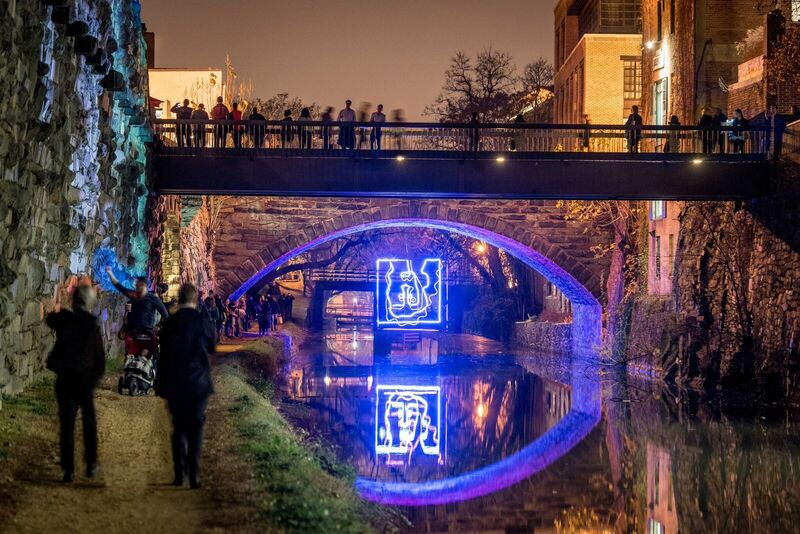 In its second year, Georgetown GLOW has grown from a weekend-long celebration to a 10-day exhibition from December 11-20, with works lit from 6-10 p.m. nightly. Attendance to Georgetown GLOW, including access to all art installations, is FREE. Five site-specific installations, commissioned by local, regional and international artists, are on view along and adjacent to the historic C&O Canal. Georgetown GLOW is organized by the Georgetown Business Improvement District (BID). Visit www.GeorgetownGLOWDC.com for information, including artwork details and a map. Georgetown GLOW information booths are located at the following locations: Grace Church (1041 Wisconsin Avenue), Jefferson Court (1025 Thomas Jefferson Street at K Street), and Pinstripes (1064 Wisconsin Avenue) Friday through Sunday, from 6-10 p.m.
Nightly outdoor musical performances from 6:30-7:30 p.m. on the lawn of Grace Church (1041 Wisconsin Avenue). Half price ($5) ice skating at Washington Harbour, the region's largest outdoor ice skating rink, through December 20 when you mention Georgetown GLOW. Deirdre Ehlen MacWilliams is a public art expert and curator whose projects have included the DC Commission on the Arts & Humanities’ 5x5 program, Foggy Bottom Sculpture Biennial, the Downtown BID’s Art All Night Festival, and Arlington, VA, public art initiatives. The Georgetown Business Improvement District (BID) recognizes the following sponsors for their generous support of Georgetown GLOW 2015: The JBG Companies, Jamestown/Georgetown Park, MRP Realty/Washington Harbour Georgetown, HOK, RB Properties, Inc., Jaguar/Land Rover, The Current Newspapers, Grace Episcopal Church, Georgetown Suites, and Think Out Loud Productions. Georgetown GLOW has partnered with Parking Panda to allow visitors to purchase guaranteed parking at many convenient locations around the event. First time users: enter promo code GTOWN25 at checkout to receive an additional 25% off your reservation at https://www.parkingpanda.com/georgetown-glow-parking?ref=georgetown. Attendees can also access the event via public transportation options, including nearby Metro stations, the DC Circulator, MetroBus, and Capital Bikeshare. For more information on getting to Georgetown, visit www.georgetowndc.com/gettinghere. Georgetown Business Improvement District visit georgetowndc.com. WIRED People Project: The Lovers by Herve Orgeas and Arthur Gallice. Photo: Sam Kittner for the Georgetown BID.